Remember when I wrote about my love of office supplies? Well, the ultimate office supply is a label maker. We had one at the banking center, and I was finding reason after reason to use it. You need labels for the tabs on your files? I'll help! The back room needs to be totally cleaned out and organized? I'll put in the weeks necessary! I became so obsessed with the label maker, that I started to think about how awesome it would be to have my own. In one of my impulse shopping sprees, I picked up a label maker. As I walked through Target, I started thinking about it. "I don't need this right now." I kept walking. I kept telling myself I didn't need the label maker. Maybe next time. So I put the label maker back. But I still thought about it. A lot. The next time I went to Target, the label maker was on sale. "It's a sign!" I reasoned and threw it in my basket. As I contiuned walking through the store, I started trying to talk myself out of buying it. But the voice in my head was not strong enough. "The label maker is on sale!" I didn't have to explain the label maker. She had been hearing about it for weeks. "I have to buy it! Please! Tell me I don't need it!" "No. But I really really want it!" "Do what I do; think about how many hours you have to work to pay for the label maker. Then think about how much you'll use it. Is it worth it?" I put the label maker back and then pouted for the next several weeks. Last week, Jacque came out of the back room and had a present in her hand. "Here. This is for taking care of the puppies while we were gone. I opened it and my heart skipped a beat. Maybe two. "You got me a label maker!!!" I immediately went on a label-making spree. Poor Evan got it on his face! 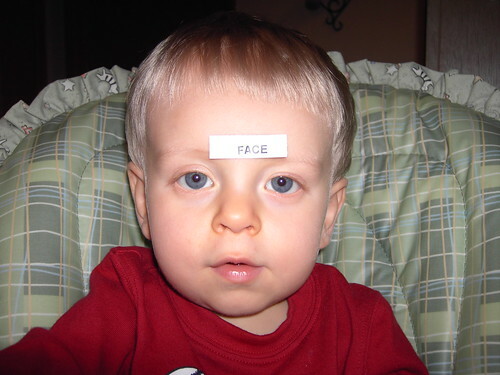 It's funny because this is pretty much the same look his momma gave me as I ran around her house labeling things.